Take the full advantage of all the features of Salesforce CRM. 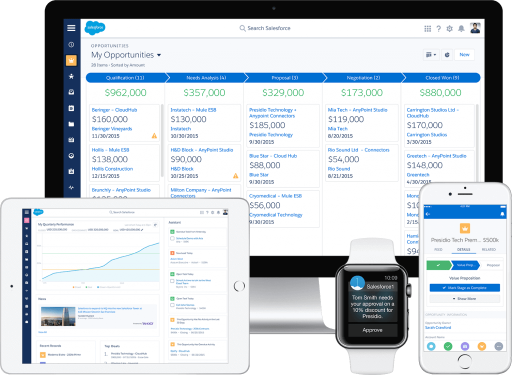 One of the programs that the companies need to include in the Salesforce CRM adaptation process is the user training so that everyone can benefit from the technology investment. Whether you have just started to use Salesforce CRM or have been using it for years, CRM Training allows everybody to take full advantage of all the features of the application. Our CRM training program, which we offer as Salesforce Authorized Reseller and Business Partner, brings 52% higher user adoption rate of Salesforce CRM. You have made your choice between Salesforce solutions, you have chosen your license package, have completed the necessary enhancements with your CRM implementation partner, and now you need to move all your team to Salesforce CRM quickly and increase their productivity. With customized CRM training courses tailored to each role, including sales and customer support representatives, marketing managers, and IT managers, you can maximize your CRM adoption rate and return on investment. We design and present a CRM training program tailored to your industry and your company’s needs and users’ roles. We work with your project team to customize the end-user CRM training exactly to meet your needs and get 100% efficiency. Gaining maximum return from your CRM application implementation begins with user adoption. Technology is only a tool; don’t forget, people drive business innovation. Invest in the training of the employees to gain the full value from CRM. With INSPARK’s training courses learn how to benefit from the applications and differentiate yourself.